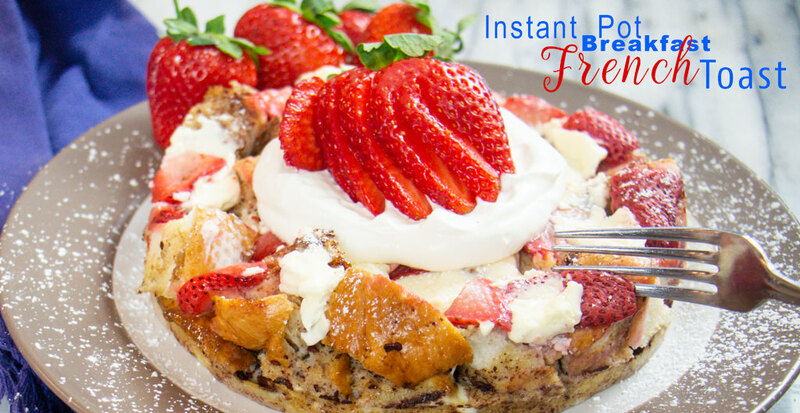 Your soon to be favorite easy Instant Pot French Toast recipe with a 2 tier pan will change the way you use your Instant Pot. 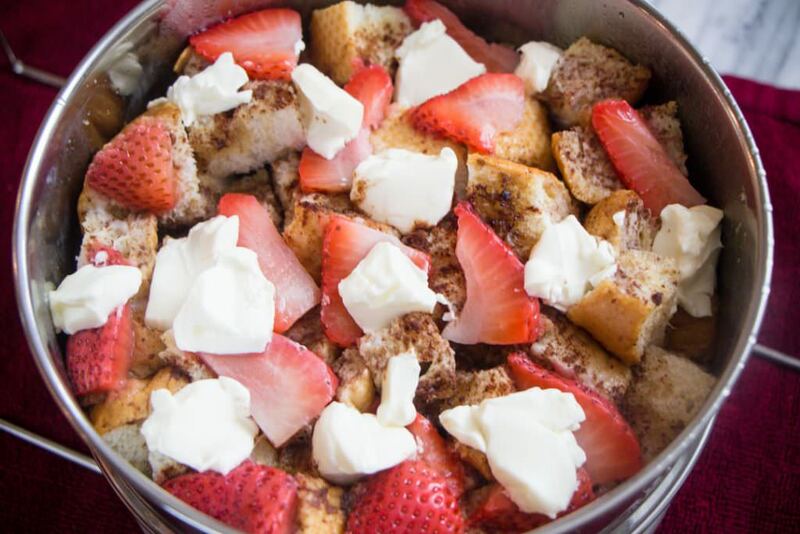 Perfect Baked French Toast for any occasion. I love using my Instant Pot and finding new ways to use it for every meal. French Toast is a favorite of mine, and making a larger batch (double batch) at once in the Instant Pot just makes sense. Especially for my boys who can eat! Instant Pot Breakfast French Toast is also great for Dinner too. What is a 2 Tier Pot for the Instant Pot? The 2 Tier Pot is an accessory for the Instant Pot and used with doing the PIP (Pot in Pot) method of cooking. But if you don’t have this accessory you can also use a spring form pan, just make sure to wrap the bottom with foil so nothing leaks out or in! A springform pan works great too. What is Pot in Pot Method of Cooking? An Instant Pot is a Pressure Cooker and needs thin liquid to pressure up. In some recipes, such as this one for French Toast, you do not want extra liquid in your ingredients as it would cause the bread to get soggy. So cooking the recipe in a separate pot still allows for water to be down below and create steam and pressure to cook the French Toast and keep liquid out of the recipe too. What Bread is Best for Instant Pot Breakfast French Toast? I use a loaf of French Bread. Although a loaf of Sour Dough Bread is also very good. You want a bread with some weight to it, a medium density bread. I also find when it’s a day old it doesn’t break down as quickly and tends to be less moist when baked. 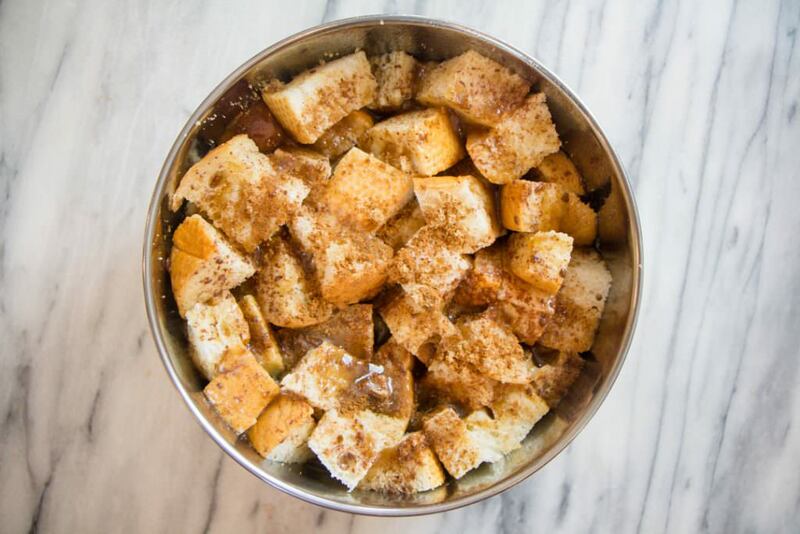 Baked French Toast is typically cubed bread topped with cinnamon and an egg mixture and baked. 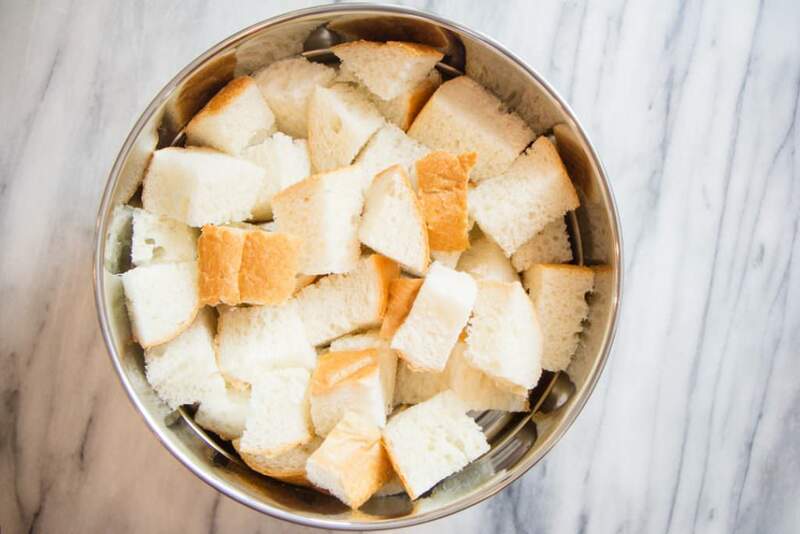 Can I make Baked French Bread in the Instant Pot? Stuffed French Toast is when you place other ingredients between your French Toast Slices of bread. 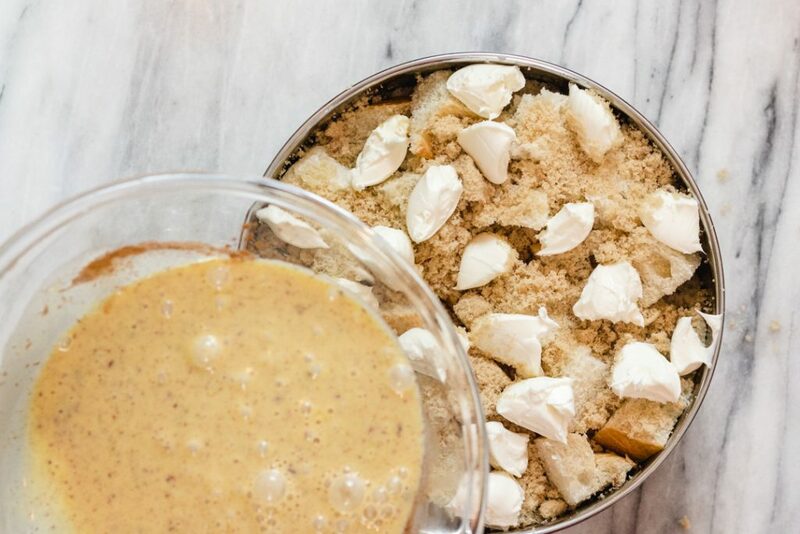 In the recipe shown, we have used cream cheese, brown sugar, and fruit. But make sure to check out our Eggnog Stuffed French Toast or our Tropical Coconut French Toast too! Of course you can! Substitute Almond or Soy Milk for regular milk. Sour dough bread can be substituted for french bread and substitute fruit for chocolate chips. The possibilities are endless. That’s what makes this recipe so easy. Instant Pot French Toast is perfect anyway you make it. Your Instant Pot French Toast will be soggy if you don’t have enough bread in your pan. There is a fine balance on the bread to egg mixture combination. It’s important to have enough bread in your pan so that the egg mixture can balance the recipe. 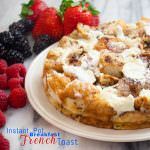 How to reheat Instant Pot Baked French Toast? Easy Instant Pot Baked French Toast can be reheated in the Microwave. In a small bowl combine eggs, milk, vanilla, and cinnamon. Whisk to combine and set aside. Dollop cream cheese on top of french toast and place lid on pan. Pour 1 cup water into instant pot and place stackable pans in Instant Pot. Remove lid, pull out pan using hot pads. 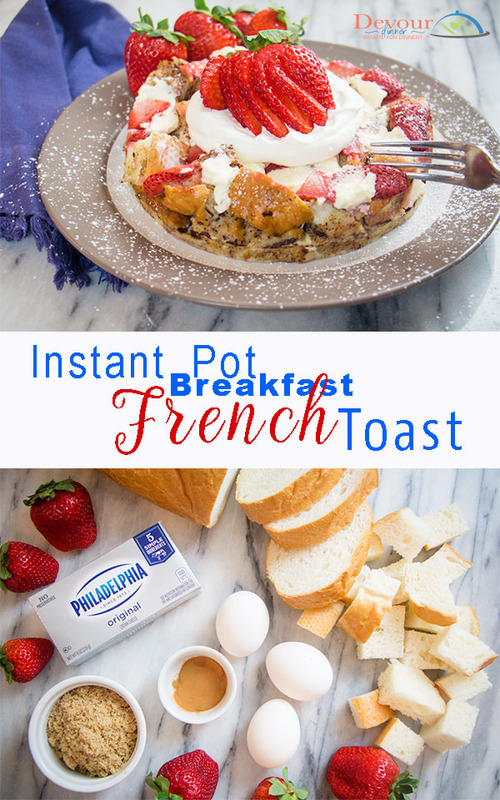 Pin this Easy French Toast Instant Pot Recipe for Later! 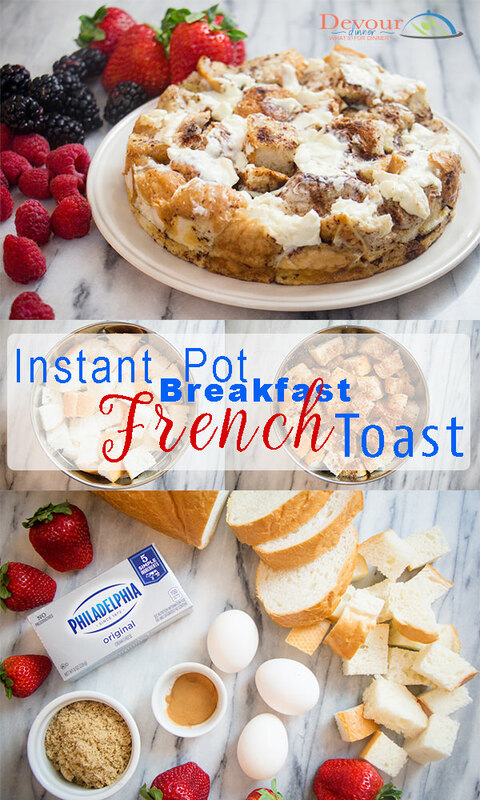 Delicious easy French Toast Breakfast in the Instant Pot will have you coming back for more. Make to your personal liking adding fruit, or sweets. Anyway you serve this Breakfast French Toast it will be gobbled right up. 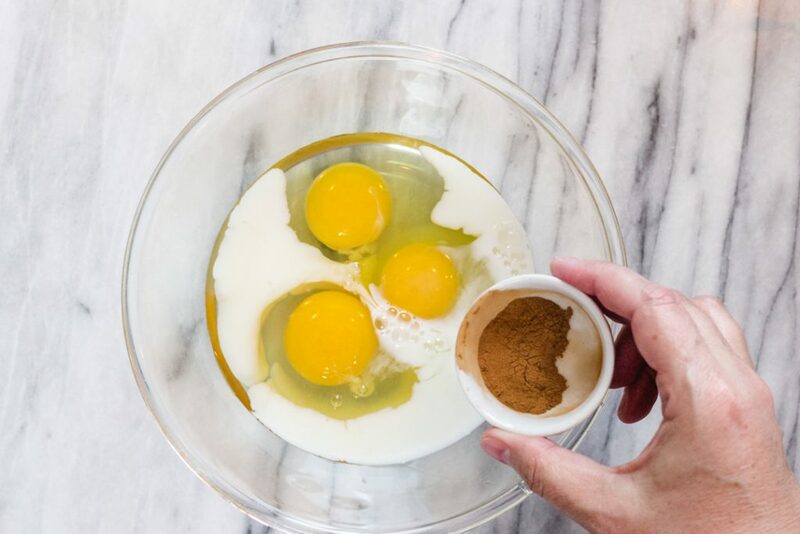 In a small bowl combine 3 eggs, 1/3 cup milk, 1 tsp vanilla, and 1/2 tsp cinnamon. Whisk to combine and set aside. Cube 1/2 loaf of french bread. Slice 1/2 cup fresh fruit *optional . Fruit can be added before the baking process and/or after. In a 2 tier Instant Pot baking insert or a springform pan insert place cubed bread. Make sure to tuck the bread down in the bottom of the pan by wedging the cubs together. Do not do this so tight the bread can not breathe but you do not want a billowing pile of cubed bread. Sprinkle brown sugar and 1 1/2 tsp cinnamon over bread. Pour the egg mixture evenly over bread mixture. 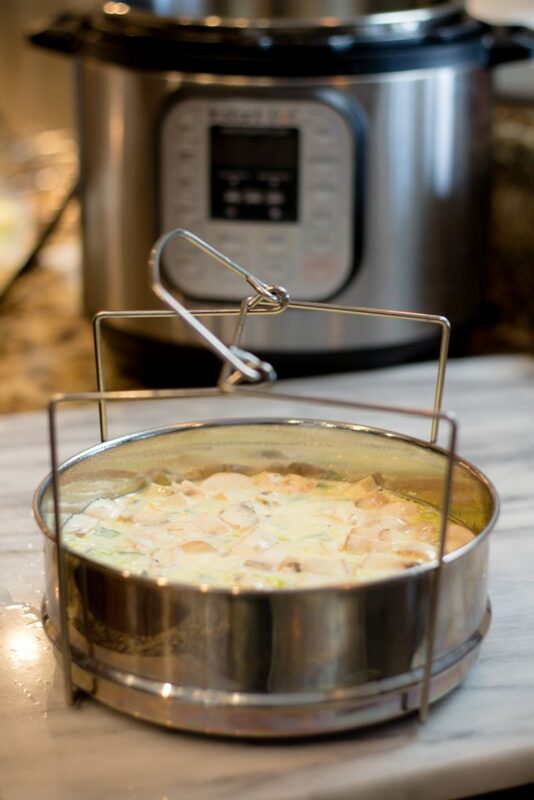 Place lid on 2 tier pan and close or place a tall trivet in instant pot for springform pan with 1 cup water. Cook on Manual for 25 minutes and Quick Release. *This recipe will fill 1 layer of a 2 tier pan insert. Serve with powdered sugar, syrup, or fresh fruit. I’m so excited to try this recipe for a family brunch! I was wondering, can I prepare it ahead of time, like the night before, and have it in the fridge so I can just throw it in the instant pot in the morning and go? Or will that ruin it? Hi Claire! This is such a great recipe. Yes you can prepare it a head of time and then cover it and place in the fridge. It will take a little longer to come to pressure because it’s all so cold. But it works nicely for those busy mornings. I hope you enjoy! What’s a 2 tiered pan? Hi Kristen, A 2 Tiered Pan is an Instant Pot Insert pan that has 2 pans stacked on each other. For this recipe you could also use a spring form pan and wrap the bottom of the pan in foil so liquid doesn’t leak or, or leak in. It’s a pot in pot method of cooking that is a lot of fun! Do you cook it longer if you double the recipe? I tried to use both my pans and after 25 minutes it was still very eggy. It was perfect when I did one recipe in one pan though. I haven’t had to lengthen the time when I do two at once. However, when I pour the egg mixture onto the bread, I pour it super super s.l.o.w… so every piece of bread gets some of the egg mixture and have found that helps distribute the egg mixture so it’s not eggy. You can also add in more bread so the bread can absorb the egg too. Can you please be more specific about the amount of bread you used. How many CUPS of cubed bread would I need? Thank You! Hi Sue! I use one loaf of bread cut into cubes to fill 2 pans. So each pan had 1/2 loaf of cubed bread. I then tucked the bread into the pan trying to get many on the bottom layer. Hope that helps! Wait until you try this recipe. It’s amazing! I love adding fruit, but the cream cheese is my favorite with every combination!